Matt Crafton was leading tonight’s NASCAR Camping World Truck Series race until a last-lap crash sent him flying through the air, letting Kaz Grala through to win the race. Eighteen-year-old Grala now becomes the youngest winner ever at Daytona in any of NASCAR’s national series. 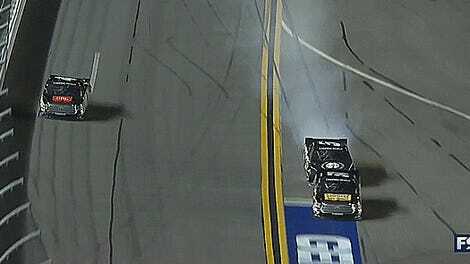 Ben Rhodes lost control of his truck as what was left of tonight’s race traffic went three-wide on the last lap, sending his truck into Crafton’s at the front of the pack as it approached the checkered flag. Crafton’s truck ended up airborne, doing a complete 360-degree flip in the air to land back on its tires tires. Still, what an unbelievably unpleasant surprise of an ending for him. 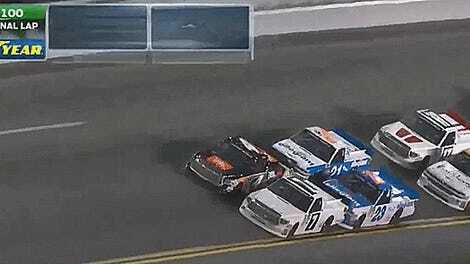 Prior to the race-ending “big one,” the race had to be restarted with only three laps to go after John Hunter Nemechek spun out on lap 94 of the 100-lap race. Rookie Grala is so young and new at this, he claimed that he didn’t know what to do to celebrate—including not knowing how to do a donut. His radio cord also came loose on lap 79, leaving him without any kind of spotter information at one of NASCAR’s most chaotic venues until the cord connection jiggled back into place at the very end of the race. Drop by the Jalopnik offices, Kaz. We can teach you the ways of the donut.